The Felipe for Tim Parker trade that came earlier this year has been fantastic for Metro. As vital as the feisty Brazilian had been for three years, the team clearly needed a shutdown central defender. They got one with Parker, who has been terrific the entire year... until tonight, when he let his old team beat him twice on corner kicks. Thankfully, Metro got a late goal from Daniel Royer to escape Vancouver with a 2:2 tie. With Metro starting a brutal stretch, Chris Armas decided to eschew squad rotation, keeping last week's lineup with one exception: Alex Muyl came in for the ailing Marc Rzatkowski. Metro struck just five minutes in. After Tyler Adams send a fantastic long ball to Bradley Wright-Phillips on the right side, the usual goalscorer crossed it into the box. Goalkeeper Stefan Marinovic came out, missed, and Royer scored from close range. 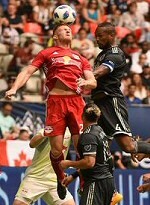 Vancouver evened it in the 42nd, when the behemothic Kendall Waston beat Parker to the air on the corner kick. The same result repeated itself in the 60th, and Vancouver was up 2:1. Felipe assisted by taking the corner. Metro's attack lacked creativity, but did have two good chances early in the second half. First, a Muyl header off a set piece hit the crossbar. The ball bounced to Parker, but the defender was denied from close range. Then, BWP was sprung, but this time Marinovic came out correctly to save the shot. It all looked lost in the 84th, when Michael Murillo got his second yellow. The first one was warrantied; this one came after a pathetic dive by Alphonoso Davies. Thankfully, in the 90th, Waston was called for a needless foul outside the box. Adams took the free kick, swinging it to the right side of the penalty area. There, an onrushing Royer once again connected. After talks by some that he has lost his scoring touch, the Austrian now has 13 on the year in all competitions. Brian White made his first first-team appearance as the late sub. Metro's bloated schedule now enters a week with both the blue neighbors and DC Scum. We'll see if Armas' lineup choices would prove to be smart soon enough. Lineup: Robles, Lawrence, Long, Parker, Murillo, Adams, Davis, Muyl, Royer, Romero Gamarra, Wright-Phillips. Subs: Etienne, Ivan, White.